I have recently reviewed some very, very expensive power distribution products, including three from HB Cables ranging in price from $4,000 up to $9,000; I have also had in for review the wonderful Audience adeptResponse aR6-TSS power conditioner at $6,000. So I was excited when I saw Alex Sventitsky at the 2013 4th California Audio Show and learned that his WyWires Power Broker cost a far more affordable $2,500. By the way, Alex and his wife Nina Sventitsky are two of the nicest people you will meet in audio, they are always such gracious hosts at all the shows. The design philosophy of the WyWires Power Broker is similar to that of the HB Cable units; instead of conditioning the AC, the Power Broker does all it can to let the AC signal flow unimpeded or allow any dirt to get into the AC signal. It is a completely passive device that uses no electrical diodes, capacitors or inductors to alter the power. As I said about the HB Cable units these may just look like fancy power bars, but they sound like so much more. Truth is, there is a substantial amount of sophisticated thinking that went into the design. The Power Broker is designed to provide the minimum restriction to the flow of AC current to your audio system. Alex’s goal was to try to get the Power Broker out of the way, that’s why it includes no filtering, no surge suppression and as I said above, no active components. Alex says the result will be increased dynamic range, better imaging, no power limiting, and no messing up of the tonal balance. The WyWires Power Broker is a high current power strip. 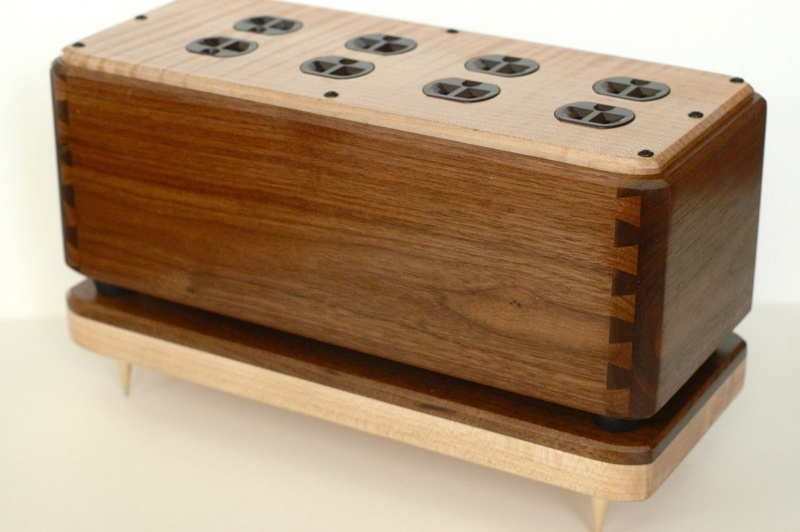 It uses 8 NEMA outlets and is housed in a beautiful handcrafted exotic wooden box. The price includes the Juice HC, a new high current power cord specifically designed for this project, a $600 value. The Power Broker looks really good in a very functional way. The build quality is very high, and just looking at it says quality and style. The box itself is constructed of 3/4″ solid hardwood in a choice of either walnut or maple for their natural resonance damping properties, and is non-conductive and non-magnetic. The receptacles are custom designed for WyWires and include contact materials that are highly conductive, resistant to corrosion, and have great tensile strength to maintain high contact pressure on the blades of AC input plugs. The internal wiring of the WyWires Power Broker is the same Asymmetrical Litz wire used in their popular Juice II power cord. The wire itself, which is pure copper Litz wrapped in two layers of cotton and enveloped in PTFE, has very low inductance, contributing to the unrestricted delivery of current. The asymmetrical geometry with differing signal propagation properties between the hot and neutral poles aids in correcting the phase angle of the incoming AC signal from your electric utility. Included for review is a high current version of their power cord called the Juice HC. This cord is hard wired to the internal wiring to eliminate any contact resistance typical of IEC input jacks. I used the WyWires Power Broker in two systems. I started with it in my video system. I plugged it into the wall and set it on its stand. Let me tell you’ll be wasting your time comparing it with and without the stand, because I did and the difference is easily heard. My system sounded more focused and my picture looked sharper with the Power Broker on the stand. I plugged both my 52-inch Sony XBR TV and the Electrocompaniet PI 2D Prelude integrated amplifier with built-in DACs into the WyWires Power Broker, the latter with the company’s Juice power cords. I also used the Juice power cord to plug in my Marantz Blu-Ray player into it and then I plugged the Direct TV DVR, and my Mac Mini into it. The WyWires did wonders for this system. At the time I was using the $6,000 Audience aR6-TSS Power Conditioner in this system. I had hoped that the Power Broker would be nearly as good, but I was wrong. In most ways it was better. The sound was more powerful, the bass was tighter, and the picture on the TV had much blacker blacks, better detail, and noticeably reduced motion blur. The difference was nearly as great in the system as it had been when I changed from the $500 Peachtree Audio Deco to the $4,000 Electrocompaniet. It was a bigger difference than going from entry level interconnects and speaker cables to the pure silver Teresonic Silver EXP cables, which was a big difference. If I had not just purchased the Electrocompaniet I would buy the Power Broker for this system. Truth is I’m in no hurry to return it and may in the end buy it anyway. I’m really impressed with how it helps the sound and the picture. Were there any ways in which the Audience aR6-TSS was better? Well, yes the sound did seem to vary less from one listening session to the other with the aR6-TSS. It also had an ever so slightly larger soundstage, more noticeable in the vertical plane. Still, these both were very slight differences that I think would be noticed only if you had both on hand to listen to. After listening to the WyWires Power Broker on the video system upstairs, I reluctantly moved it down to my reference audio system. I say reluctantly because I hated to take it out of my digital video system. In the reference system the Power Broker was put in the place of the $9,000 HB Cable Design PowerSlave Marble. There is more in common between the HB Marble’s design and the WyWires Power Broker than there is with the Audience adeptResponse aR6-TSS. Also plugged into the WyWires were my Wavac EC-300B SET amplifier, my AMG Viella V12 turntable and my Soundsmith SG-220 Strain-Gauge cartridge system. The Power Broker came across very well in this system. It gave me about 75% of what I get from the HB Marble. It shares the fullness, powerful, and big sound with the HB Marble; though you just don’t get quite as much. If memory serves me right, I think it is as good or better than the $4,000 HB Cable Design PowerStar Horizon. If I had not heard the HB Marble I would probably be tempted to make the Power Broker my reference. I was extremely pleased and somewhat surprised with the way the WyWires Power Broker allowed music and video to be played on both of my systems. The picture on the HDTV was more vivid with blacker blacks and less noise. Music played with more intensity, had great pace and flow, and the soundstage and imaging were improved with the Power Broker. The top-end lacked any hash and sounded clean with an effortless beauty. Personally, I think the WyWires Power Broker is the best value I’ve come across at getting clean AC to my equipment. Well done, indeed! The Power Broker box and platform are engineered and manufactured by Daedalus Audio, which also makes some of the world finest solid wood loudspeakers.